Cloud consulting offers independent, professional advice to create and optimize your strategy in the Cloud. We have been working for many years with different cloud providers and specialize deeply in Amazon AWS services. 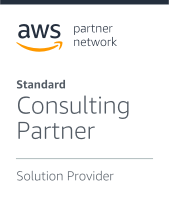 Our experience and engagement has been recognized by AWS in forms of accreditations, certifications and partnership programs. We support your organization in migration to the cloud and in optimizing your existing Cloud solutions. Our business development consultants help you to lower your CapEx costs towards OpEx by preventing upfront investments and leveraging pay-as-you-go model. Our soulution architects and DevOps engineers will help you to pick and use Cloud technologies and applications, which suit your business and technical needs. Our system administrators will ensure that, once the system is running, it is correctly monitored and provides seamless, scalable operations. So that you can focus on expanding core of your business. We have been proudly selected to develop several Platform-as-a-Service soltions for technology companies. Having broad experience with technologies such as docker containers, orchestration systems (like Kubernetes, ECS, EKS, Nomad), autoscaling mechanisms and software-based storage/networking - enables us to deliver highly automated solutions, which minimize operational efforts. As benefits of such automations, development teams are no longer constrained by capacity of system operations or DevOps and can deliver prototypes and production-grade systems within days. Automation with HashiCorp Terraform or CloudFormation ensures transparent Infrastructure-as-a-Code way to describe and manage your physical and virtual infrastructure stacks in an agile way. KoreKontrol offers trainings and integrated solutions, which include acceptance testing, compliance and security checks and continuous deployment. Utilizing cloud-based services enables quick product development and competetive tool access, especially in fields like Iot (Internet of Things) / AI (Artificial Intelligence) and ML (Machine Learning) / Voice services (Alexa). Function-as-a-Service is a new software development and operation model, where the only part that is maintained by customer is the code itself. Infrastructure to run is provided as a managed service, so no effort ("No-Ops") is required for typical maintenance tasks, related to operation, backups, scaling, deployment and logging. This enables building systems designed to massively scale on demand and allow huge savings in operational costs, while minimizing development efforts and time-to-market. Idle resources time - like underutilized server - are no longer concern as well, thanks to the innovative billing model per function execution time. Amazon AWS offers several technologies (like lambda, step function, triggers based on data changes in S3 / DynamoDB or queue messages) and other interfaces (like API Gateways), making their offer most broad and complete on the market. If you are looking in individual solution - do not hesitate to ask questions. We are actively working extending product portfolio in this area. As a young and flexible company, we might be able to provide a non-standarized soltions to enterprise customers. KoreKontrol offers experience in working with various SQL databases and NoSQL data stores. We have been succesfully delivering architecture consulting, capacity planning, performance/cost optimisation and replication/backup strategies for operational SQL databases (MySQL, PostgreSQL), Key-Value stores (Memcache, Redis, ARDB), search and indexing engines (Elasticsearch, Apache SOLR), NoSQL databases (Cassandra, MongoDB, DynamoDB, Couchbase), distributed analytic stores (Redshift, Snowflake), and queue brokers (RabbitMQ, ActiveMQ, Apache Kafka). Learn with us how to prototype in hours, deliver in days, work agile - also in BI / data analyst areas. Cloud-based BI and analytics solution allow quick setups and fast processing of various amounts of data, while keeping budget under control and actually saving money. Our experience includes creating data lakes, processing live data streams, executing distributed batch analytic jobs, storing up to petabyts of data and delivering results in user-friendly form.